Earlier this week, I posted a thorough guide to wireless portable speakers covering everything from mechanics, materials, and electronics. Today we are going to go into greater depth on looking at specific features of portable speakers to determine which is the best for you. Be sure to check off this list when you’re selecting your portable speaker. There are a lot to choose from, so these questions will help make sure you have the model and style that best suits you. What type of driver does this speaker have? What is the wattage? Did you give it a good listen or has it received strong reviews? What is the power source? Does it come with rechargeable batteries or will you have to plunk in additional heavy alkaline batteries? What is the run time? Does the portable speaker have a manufacturer’s warranty? If so, what are the terms? Does the portable speaker fit your general application and use case? How portable is it? How durable is it? Does the portable speaker offer wired or wireless connectivity? Will it work with your device/music source? 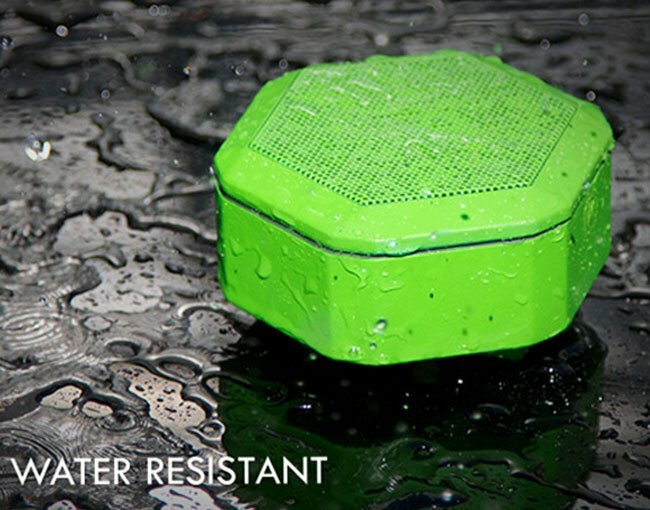 Is the speaker weather rated or waterproofed? If you own a smartphone, there is very little reason to buy a wired portable speaker. The cost of Bluetooth speakers has come down significantly in the last couple years and smartphone adoption has increased 28% annually. Wired portable speakers come at less cost, but the added flexibility gained is well worth the extra price tag. When you think about the user experience, it is really nice to have your smartphone untethered from your speaker. If you are really “low-tech,” then a wired speaker is fine, but I would advise taking the time to learn how to use Bluetooth. High quality Bluetooth speakers range from $50-150. There are a number of cheaper models on the market, but beware of units that have poor components as they are likely to fail or have poor sound quality. Wired portable speakers should cost no more than $50. Turn the Bluetooth Portable Speaker On and turn into pairing mode. On the Boombot REX, simply turn on the switch. On the Boombot2, press the center button twice till the LED blinks blue. Your portable speaker will now look for a media device to pair with. On your smartphone/mobile device, go to SETTINGS. On most Android phones, go to WIRELESS SETTINGS. On iOS (iPhone), go to to BLUETOOTH. Make sure Bluetooth is turned ON. Find the device that you want to pair with. Typically manufacturers will have the model name pop up (i.e. Boombot2 or Boombot REX). Select that device and engage in the “handshake” process. Once connected, the smartphone should show “connected” or “connected to media audio”. Once you see this, you should be able to play music through your Bluetooth speaker. This pairing process typically only has to be done the first time that you pair your device. The subsequent times you turn on your portable speaker, your phone should automatically pair for seamless operation. As you can see, using a wireless Bluetooth speaker is incredibly easy, so if you’re a tech phobic, then you should just take a moment to come to the future. Really. Some wireless portable speakers feature a microphone for interfacing with phones. This feature is extremely useful for conference calls, Skype, and other VoIP services. Some models incorporate track and playback control. The Boombot REX is one of the first speakers featuring built-in voice control/Siri integration. Several more sophisticated Bluetooth Speakers are incorporating NFC to initiate pairing operations including the Monster Beats Pill. When purchasing a portable speaker, be sure to think about your use cases. If you need something really ruggedized for camping, beach, or generally more abusive activities, look at designs like the Philips ShoqBox, OT Turtleshell or Boombot REX. If you want something for at-home use, the Bose Soundlink sounds amazing, but it is the most expensive. And also the bulkiest. The Big Jambox sounds better than the Bose, but the design is generally kind of fragile. It is well built, but because every side has mesh, it can easily get scratched or dented. Boombotix: That’s us. We are the little garage startup to save the day. Boom Movement: These guys are owned by the same holding company that does Polk Audio. JBL: These guys have been in the game a long time. They make good stuff. Logitech: Software company gone mouse maker to hardware giant. Nokia: Known for their phones, Nokia is like a little Samsung. Philips: You may have seen their light bulbs, but their product depth runs DEEP. iHome: Makers of the most popular clock radio. They sell tons of speakers to hotel chains. Panasonic: Electronics giant, 2nd largest headphone manufacturer. Based in Japan. There are many more out there. I would encourage you to take the time to understand the differences of all the different speakers on the market. If you’re spending MORE than $200, you are probably spending too much. Check out some of our portable speaker comparisons. — level of durability of our Boombot REX. One speaker does come close, though — Philips’ Shoqbox. As such, this warrants a showdown comparison of the two durable portable speakers. Both are shock and splash proof, can survive a drop, and even take the occasional whack. But when we took a closer look at them, well, that’s when it becomes pretty obvious as to which is the better Bluetooth speaker (spoiler alert: it’s not even close). By the time we had pulled out the JBL Charge from the box, we’d already gone through handfulls of speakers. We were expecting to hear something a lot like the Philips ShoqBox, but there might just be a little bit more to this Tall Boy sized guy. Most of the products around this size got man-handled by the output of the little Boombot REX. Finally, something stood its ground and provided a worthy opponent. JBL is certainly no stranger to making thumping sound systems, but this would really be the test on whether their brand could take their line into the world of portable speakers. These are some of the loudest portable speakers in the game and we hope this article helps pick which is right for you. The JBL Charge goes for the Amazon street price of $149.99 while the Boombot REX tips the scale at $119.99. It was actually pretty interesting stacking these two competitors next to each other. The JBL Charge seemed to be missing a lot of rudimentary features that would be expected from a speaker at that price point. However, it has an internal 6000mAh battery that provides enough juice for a robust amp AND the USB out. If you’ve ever uses a Mophie Juice Pack, you’ll love that you can get several charges on your smartphone from the speaker itself. Pretty clutch feature. The form factor of the JBL charge isn’t particularly amusing. The plastic seems strong and the overall build quality is sturdy. It has this design that seems to transgress between being a rugged outdoor product and a traditional gadget. Seems to be a slight ID crisis, but there is nothing that’s standout ugly. As mentioned, the JBL Charge is about the same size as a PBR 32oz Tall Boy so it’s easy enough to lug around, although I would hesitate on a longer hike as this has a pretty substantial weight. The Boombot REX maintains a much lighter frame while still having clean, sharp, bold lines. At about one-third of the spacial volume of the JBL charge, the Boombot REX is a better alternative for those looking to travel greater distances with their speaker. The Boombot REX includes several bells and whistles not found on the JBL charge including a track control interface and Siri/Voice-Control integration. Boombot REX also incorporates daisy-chain capability. If it can’t outdo the Charge with one, it sure as hell can with two! No joke, the JBL Charge was one of the most impressive sounding speakers we had tested. The amount of bass generated from this thing is truly remarkable. The Boombot REX actually had very similar mid range and high range to the JBL Charge, but the low end bass was certainly dominated by the JBL Charge. If you are more of a backyard horse shoe throwing candidate that doesn’t need a lot of versatility, OR you just don’t mind size/weight, the JBL Charge is the ticket. If you are a little more on the adventurous side and want a speaker that won’t slow you down, the Boombot REX is a standout player on that category. Overall, the handsfree and microphone capabilities of the Boombot REX make it a more versatile product, but the JBL Charge certainly has its’ place in the world of top portable speakers. Thanks for checking out our portable speaker reviews. Let us know if there’s anything you’d like us to test. Today we compared the Beats Pill to our Boombot REX to determine what are some of the Top Bluetooth Wireless Speakers here in 2013. Below is a chart showing you some the key differences between these two speakers. Beats has become a household name in the headphone market owning more than 65% market share of premium headphones. This will be a true test on whether or not they can take the headphone expertise and apply it to a slightly more challenging project in building a great sounding speaker. The Beats Pill retails for $199 although it is currently seeing an Amazon street price at $156. SOMEHOW, despite this abysmal sound quality, it is maintaining a 4-star rating on there. The Boombot REX is currently on pre-order at $119.99 with an anticipated launch date poised for June 1st from Boombotix direct and Apple.com. Despite the millions of dollars of R&D, the Beats Pill has some of the most bizarrely distorted acoustics we’ve seen out of all the portable speakers we’ve tested. It’s almost as though whoever built it was on a pill of some sort. The Beats Pill is driven on four small one-inch drivers while the Boombot REX runs off of two 1.5-inch drivers and a passive radiator. To get an idea of just how bad the Beats Pill sounds, you should probably watch the video. The Beats Pill has a couple of bells and whistles including NFC pairing. For those of you that use Android, this is pretty useful. If you’re familiar with the Jawbone Jambox, the Beats Pill is like the round version of the Jambox without nearly the low end frequency performance. We actually maxed out the Beats Pill to the point where the amp seemed to just quit and make a static humming noise. We thought that was very interesting. The Pill is wrapped 360-degrees in a fine speaker mesh. While it looks good, I worry a little that it will get bumped very easily. It is small enough to slide in my pocket, but it kind of looks like a banana if you catch my drift. The Boombot REX is quite a bit lighter and more compact that the Beats Pill. If you are looking for a more adventurous companion, this could be a better bet. The integrated clip makes this unit infinitely more versatile and mobile than the design of the Beats Pill. The Boombot REX also incorporates built-in Siri/Voice-Control allowing for a more seamless handsfree experience. The Beats is available in a narrow selection of 3-colors (red, white, and black) while the Boombot REX will be launching with 4-colors in the initial run and a full Limited Edition series to be released in July 2013. Check out some of our other Portable Speaker Reviews and comparisons if you want to get the pulse on all the best mobile audio gear on the market.